The product effectively protects the skin from wind, winter cold (up to -30ºC), rapid temperature changes, UV radiation and free radicals. 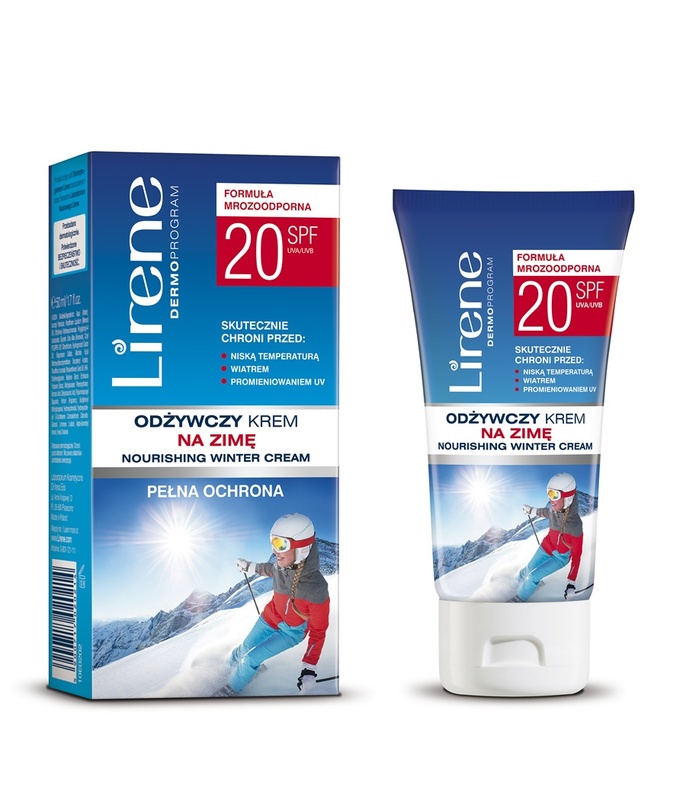 The product is part of the Lirene Dermoprogram developed by Lirene Science Laboratory experts. The cream effectively protects the skin from wind, winter cold (up to -30ºC), rapid temperature changes, UV radiation and free radicals. Echinacea extract makes the skin more resistant to environmental aggressors. Combined with vitamin E, it immediately and lastingly stimulates natural skin defence and regeneration. Thanks to allantoin acting in synergy with the soothing passion fruit oil, the cream relieves irritation and redness caused by cold. It protects the skin from frostbites by regenerating and strengthening the protective epidermal lipid layer. The rich formula restores the proper hydration and nutrient levels. A protective SPF 20 filter provides a high level of protection from the harmful effects of sun rays, and a water-resistant formula ensures safe use during snow or rainfall. The cream leaves the skin elastic, smooth and perfectly protected from environmental aggressors during winter. Is this the right cream for me? This product is recommended for the skin which needs a cream that delivers effective lasting protection from winter cold, wind and UV radiation. The formula improves skin elasticity and smoothness, and delivers excellent hydration and nourishment. The cream’s active ingredients prevent frostbites and eliminate redness, skin scaling and the taut feeling which can result from skin exposure to low temperatures. The cream glides on easily and is perfect as a make-up base. The cream is suitable for all skin types. A water-resistant formula. Use each time before going outside in low temperatures or harsh wind. Apply the cream onto the cleansed face and neck, spread and smooth it on gently. *An in vivo test conducted under the supervision of dermatologists – an assessment of female subjects with normal, dry, combination and sensitive skin after 2 weeks of product use.